You’ve heard it before: Politicians say they’d love to take action against climate change, but they’re reeling from the sticker shock. Today, a new report from the United Kingdom’s leading climate change watchdog refutes the oft-cited argument that climate action will herald economic Armageddon. 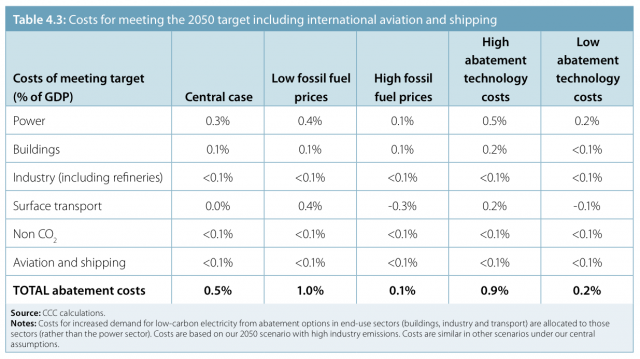 The Committee on Climate Change (CCC) report, with the hairy-sounding title “Statutory Advice on Inclusion of International Aviation and Shipping,” says that in 2050, the UK’s emissions reductions across the whole economy will cost 1 to 2 percent of the total GDP. This updates, in greater detail, the range predicted half a decade ago by the watershed Stern Review. Just how much is that? For a rough comparison, 1 percent of the UK’s 2011 GDP is a little more than what the country currently spends on public housing and community amenities and is no where near the big-ticket public spending items like health care. The United Kingdom has enshrined in law an emissions reduction of 80 percent on 1990 levels by 2050. Cost is a familiar argument against climate action for US readers. As president, George W. Bush refused to ratify the Kyoto Protocol, calling it a job killer that placed unfair economic burdens on the United States while letting poorer countries off the hook. And in Congress, the ill-fated cap-and-trade bill of 2009 fell victim, in part, to arguments that consumers would foot the bill by paying more for electricity. The Heritage Foundation said cap and trade could raise the average family’s annual energy bill by $1,241. House Republicans called it “a light switch tax that would cost every American household $3,128 a year,” a statement that has been widely disputed. The cost in GDP terms in the UK report echoes what US studies have found. The Congressional Budget Office reported similar reductions would reduce the GDP here by 1 to 3.5 percent in 2050. One of the cosponsors of the 2009 cap-and-trade bill, Rep. Edward Markey (D-Mass. ), said the scheme would cost the average family the equivalent of “about a postage stamp a day,” far less than critics claimed.